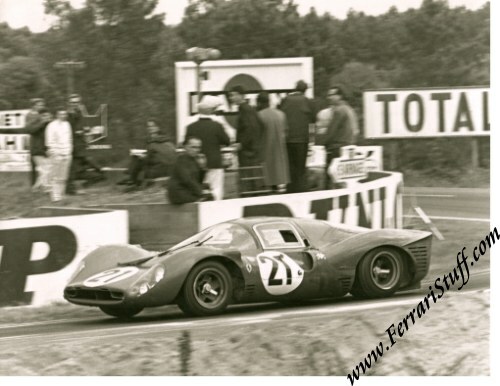 1967 Photo of Ferrari 330 P4 S/N 0858 at the 24 Hours of Le Mans with Ludovico Scarfiotti and Mike Parkes. This is a ca. 20 year old print from the original negative of the 1967 photo of the Scuderia Ferrari factory entered Ferrari 330P4 S/N 0858 of Ludovico Scarfiotti and Mike Parkes en route to second overall in the 1967 24 Hours of Le Mans. It shows the car rounding the famous Mulsanne corner and heading towards Indianapolis and Arnage. The car in question was later modified significantly, first to Barchetta specs and then to Can-Am Group 7 Spyder spec and seems to reside in the USA. The photo measures some 21 x 16 cm or 8 x 6 inches.